I haven't had time to play Half-Life 2 this entire past week, but now it's weekend (yay!) so I have some time to unwind. Today the unwinding has mostly consisted of playing Half-Life 2. As you might have guessed from the title I completed the game tonight. I was in one of the last sections of the game, so I only played a couble of hours to complete it. I was a little worried about how the ending would be, because many people have been complaining about being disapointed about the ending. I throught it was okay. It's not very climatic and there isn't a huge evil alien boss as might have been expected. It's also very open ended. 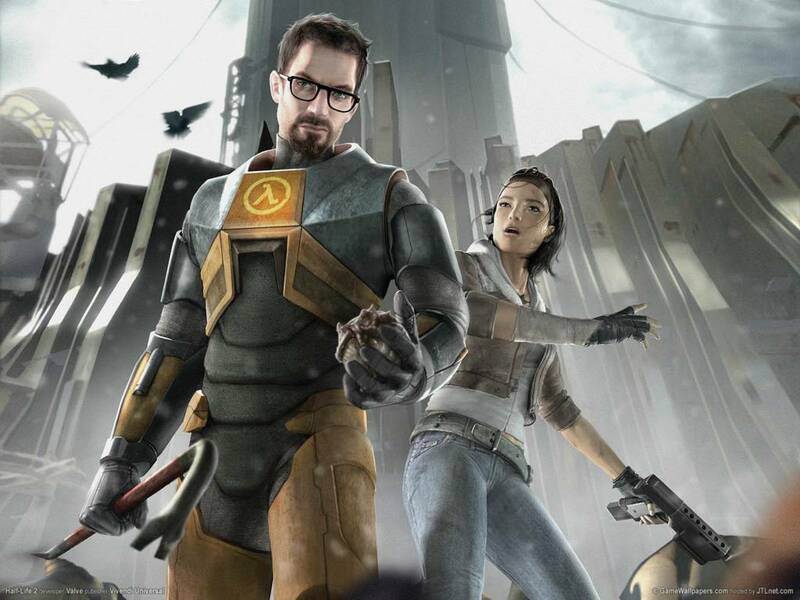 There's definitely a Half-Life 3 planned for the future. Something that annoyed me a bit was that I the last two chapters inside the citadel you see at least three strage alien creatures, that isn't found anywhere else in the game. And you can't get close to them or interact with them, and it just seems like such a waste to not encounter them somewhere. Both from the developers and the players point of view. Other than that, I really enjoyed the citadel levels, which bring a refreshing (major) change in the gameplay! VALVe says the full Half-Life 2 SDK (Software Development Kit) should be out next week, but VALVe isn't exactly known for keeping deadlines and release dates so I wouldn't put my money on it. But it's comming soon, and I have no doubt that it'll be a blast playing around with it. Until the SDK is out I think I'll be starting a new game to enjoy the improved enemy A.I. at level: Hard! ... "Working For The Next Day". Work as described by Bob Marley & The Wailers in the song Work, from their Uprising-album. As of last friday I've got a new work which is really eating up much of my time. And most of the time home from work is spend recovering from work. It's not a great job, but it's only a temporary job and it pays well, so it's okay. I planning on keeping this job until I start at the University of Aarhus, in the computer science-line. Who knows - I may even have saved up some money to help me getting through the university. As I get more used to my new job I hope to find more energy to read some of the programming book that are in my (rather large) books-I-should-read-pile. When I find time to read and (hopefully) get smarter I'll use this blog to tell about interesting techniques, algorithms etc.. I've just been to the cinema to see Pixar's newest animation movie The Incredibles. And it was... well... incredible! Just as Pixar's other movies. Those guys really know what they're doing. I saw it with my father who's 51 and my littlesister who's 8 and we all had a great time. Lots of fun-filled clean action for the kids, and some family/relationship issue aspects for the older audience. I think it's mainly aimed at ages 7-18, but there's also a lot of small jokes for the older audience. Good clean entertainment for the hole family. If you liked Toy Story, A Bug's Life, Shrek, Ice Age and Finding Nemo you're going to love The Incredibles. Go see it! The short animated movie that Pixar presents before the movie alone is worth the ticket price. The good people at IMDb seem to agree with me that's it a good movie, giving it a total score of 8.5/10. To talk about something other than Half-Life 2, I'll like to take a moment to point you to an exellent technical blog/journal. The owner of the blog is Kurt Miller, primarily known as the creator of the great game development site flipCode.com. Unfortunetly the projects he's talking about in is blog isn't put up for download, but there are some very interesting technical articles, throught and references. It's fantastic, incredible, unbelievable. It's everything we've hoped it would be and more! It has it all: outstanding graphics, atmosphere, artificial intelligens, superb physics, puzzles and more important of it all; gameplay! I have only played about three hours, but this is the greatest FPS game I have ever played, and I'm sure that the rest of the game won't make me think otherwise. If you haven't bought it already, BUY IT! You're going to sooner or later, so you might as well get it now. Half-Life 2 In My DVD-Drive! Yeah well, I've biked downtown, bought it and biked back, and now I'm in the middle of the installations process. It isn't going very fast, but there's also a good portion of data to install. 4.5 GB to be more precise. And when that's completed, I have to unlock the game via Stream. Hopefully that dosn't screw up. Steam has been riddled with bugs previously, but it seems to have gotten pretty stable now, so I'm confident that it'll work. It's Half-Life 2 day tomorrow!